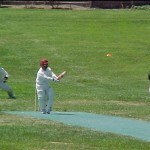 Cricket coaching around San Ramon, Dublin, Pleasonton? 14 teams from Pleasanton , Dublin, San Ramon and Mountain House schools and after school cricket clubs are competing in the 4th Edition of Cricket for Cubs Spring 2017 Inter-School tournament are going to play the finals scheduled this Sunday May 21, 2017 at 12:30 pm (Elementary Division Finals) and 2:30 pm ( Middle School Division Finals) followed by the closing ceremony. The location is Emerald Glen Park, Dublin. David Haubert, Mayor, City of Dublin and other Council Members. Jerry Thorn, Mayor, City of Pleasanton and other Council Members. PUSD, DUSD, SRVUSD Board of Trustees. Appreciate if all the passionate cricketers in the community come and cheer for tomorrow’s USA team members along with your friends. Want to thank our grand sponsor, Kaiser Permanente and Trophy sponsor, ThinkPalm Technologies for supporting the event along with NRI Wealth Management, Sikandhar Cash and Carry Grocery Store and Chaat Bhavan. 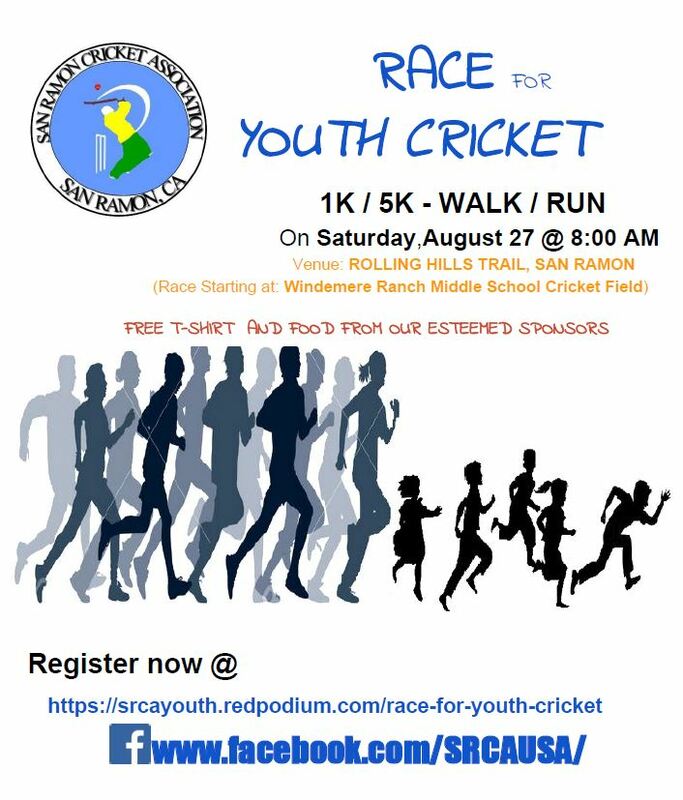 San Ramon Cricket Association (SRCA) Youth is conducting 5K run / 1K walk to bring awareness about youth cricket program in Tri-Valley. Please join us and create awareness about cricket with in the community. Moreover, help to pass our beloved sport to the next generation. Please register for the event and pass on to your friends and family to register for the fun event, thanks. Cricket Season has started in bay area. We are playing in top prestige cricket league in bay area (NCCA- North california cricket League) and planning to increase our count with good all-round players. Summer games are going to be 45 overs games and requires lots of energy and temperament. Looking for serious players who wants to take their game to another level and enjoy every part of game. The Tri Valley Cricket Club (TVCC) has been successful in restarting the club after sitting out 2010, thanks to some new recruits moving into the tri-valley area and availability of a great indoor practice facility. The season play starts up next saturday (April 30, 2011) and runs till end of August. The club (within Tri Valley Cricket Foundation) will be playing T30 format under NCCA, which is the oldest organized cricket association in northern california. This year the club was not able to secure the Dublin Emerald Glen park ground from the City. So they will be playing out of Tracy (which is a “batsman’s paradise” – located at Krohn Road, Tracy, CA 95377). However, they are hoping to get back to playing in Dublin next year. To qualify to play in the grounds, the club needs to attain the non-profit status 501(c)(3). However if they cannot attain the status on their own, the Club plans to look towards some Dublin based organization to sponsor them. The status requires that the organization’s membership is open to public, serves Dublin community, and membership must be ideally 51% Dublin residents (though there are ways around that). There are additional rules and insurance requirements. Get your kids off Video Games !! And onto a sports field – running, exercising and playing sports !! 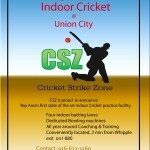 Now gear up to practice Cricket – indoors! The cricket fans in the bay area have something to cheer about. Next month (September), an indoor cricket practice facility is opening up in Union City. It will have four indoor batting lanes with dedicated bowling machines. Coaching and Training will be available. The facility is located 2 minutes from the Whipple exit on 880. CSZ will have plenty of options ranging from Team packages, individual packages, kids coaching, one on one training with certified coaches, international player appearances, Bowling machine practice, agility training, sponsoring national teams youth teams etc. This could definitely increase standard of cricket in Bay Area and help produce more national level players from the region. For more information, call 916-612-1160. In response to resident concerns, the San Ramon Recreation commissioners modified the Cricket hours at Monarch Park to 9 a.m. to 4 p.m. once the school is opened for play in August and stipulated that the 240-member association strictly adhere to the time constraints. The league will play cricket on Saturdays at Windemere Ranch Middle School, while league play on Sundays would remain at Monarch. Noise, traffic and not being able to use the park when they want are just some of the complaints that neighbors of Monarch Park on North Monarch Road have about organized games of the sport made popular in Britain, India, Pakistan, Australia and other countries. 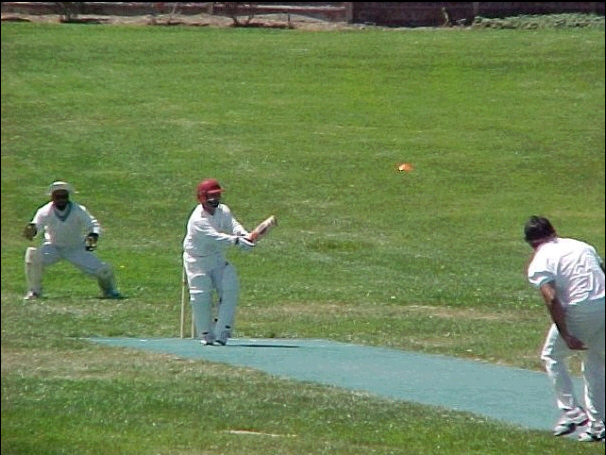 The San Ramon Cricket Association rents the Monarch Park cricket pitch — the only one in the city — to host its league games on weekends from March through November. 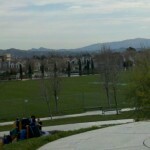 For about the past two years, games have taken place from 8 a.m.-5 p.m. Saturdays and Sundays at Monarch Park. As of Aug. 1, the commission would permit league cricket play on Saturdays at Windemere Ranch Middle School, while league play on Sundays would remain at Monarch. The parks staff is also asking that the cricket pitch — the only one in the city — remain at Monarch Park and be rented to sports organizations for group play. Parks staff would also like to look at possibly adding a cricket pitch to the yet-to-be built Rancho San Ramon Community Park. 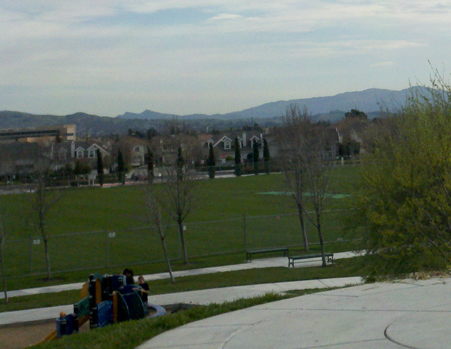 The 35-acre Dougherty Valley park is not expected to be built for a few years. The vast majority of the association members, composed of about 70 percent of San Ramon residents, hail from countries including India and Pakistan, where the sport, played on a 360-degree field, is hugely popular and part of the heritage. Following the vote, which Commissioner David Ernest opposed, league leaders said they were pleased. But some neighbors said the decision failed to address several issues. Stephen Moy said the small neighborhood park on North Monarch Road was never intended for adult league play — of any sport — and that cricket players deserve a more suitable location. Samantha Finnegan, a mother to children ages 2 and 4, said she remains concerned about safety after seeing the cricket ball fly into the playground area and cannot use the park on weekends when she is off work because the fields are occupied. Although the commission’s decision will stand unless appealed to the City Council, the location issue will be revisited when the Parks and Community Services Department updates its master plan, said Director Karen McNamara. One potential site for a permanent cricket field is the 35-acre Rancho San Ramon Community Park slated to be built in the next five or six years by Dougherty Valley developers.